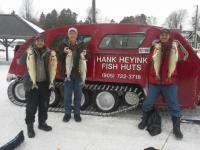 Lake Trout, Whitefish, Herring & Perch. Heated bombardier travel to heated huts with cookstove upon request and lights for night fishing. All within 1 hour of Toronto.